I remain bitter about the call. My screams after the handball decision against Memphis are still echoing around my apartment. The dog is freaking out and my neighbors have cited me for a noise violation, but I stand firm. When the ball struck Tristan Hodge’s arm, it was drawn in to his chest and not obstructing play. When a bad call goes against you like that, there’s always a creeping sense of dread that you’re about to be punished. Sure enough, North Carolina FC equalized off the resulting free kick in pretty much their only opportunity in the final quarter of the game. And thus, Memphis’ first road adventure came to an end. And you know what? It was a fantastic three games. 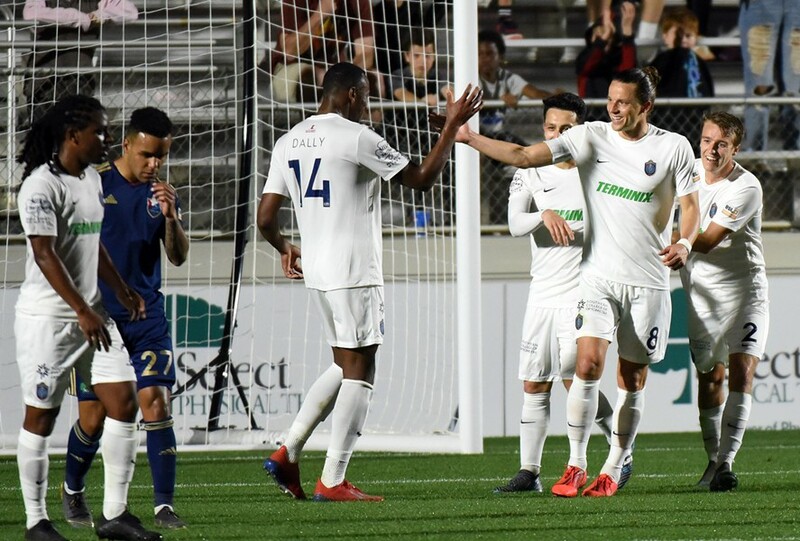 The franchise picked up its first win, had an excellent performance in a 3-2 loss against New York Red Bulls II, and, but for some bad luck, should have walked away with a victory this weekend. Memphis started the game on the back foot, North Carolina dominating possession looking to use their quick forwards down the flanks; it wasn’t until after the first 10 minutes that 901 FC strung a decent passing sequence together. During the early onslaught, Memphis’ outside backs struggled. Wes Charpie in particular was lucky to escape a yellow card after a pair of early fouls that stopped the North Carolina attack cold in its tracks. Despite the heavy pressure, the center back pairing of captain Marc Burch and Jacob Hauser-Ramsey held firm. Really, the only chance that Memphis conceded was a deep cross to the back post, which two North Carolina players couldn’t connect with. Once Memphis started to string more passes together, the game improved immensely. Marc Burch had some decent free kicks into the box, but there wasn’t really a clear chance until the 39th minute. Wes Charpie slipped while trying to cut out a pass, allowing North Carolina to race clear on goal. Manny Perez, who the commentators had been drooling over all game, tried to round goalkeeper Jeff Caldwell, but the Memphis stopper came up with yet another big save and swatted the ball out of play. There’s no overstating a play like that. Having a shot blocker who can pull a rabbit out of the hat every match lets the defense play with confidence and bravery, and provides the foundation for Memphis to keep playing its game. Memphis almost took the lead right before halftime, with Morgan Hackworth finding space in the box to lob the keeper, but the ball came back off the underside of the crossbar. 901 FC wouldn’t have to wait long, however. In the 62nd minute, it became apparent that North Carolina defender Da Luz hadn’t read my first column. While holding possession for too long outside his box, Memphis midfielder Ewan Grandison roared upfield and dispossessed the Da Luz right outside the 18. While trying to make up for his error, the defender pulled Grandison to the floor, earning himself a red card and awarding Memphis a penalty. After Burch slammed his shot down the middle to give Memphis a 1-0 lead, it should have been cut and dry from there. Unfortunately, the strange handball call gave North Carolina its only opportunity to equalize, and it seized the chance. Jeff Caldwell edged towards his far post during the run-up, but Marios Lomis took advantage and surprised Memphis by hitting his free kick to the near post instead. All square, and that’s how the game would remain. Memphis cranked up the pressure and came close a few times, but ultimately left the field with a point gained. There is that sense of “what could have been,” but the positives far outweigh the negatives. 901 FC wrapped up its first road trip with four points and some excellent performances. Not bad for a fledgling franchise! * After these away games, I maintain that Duane Muckette is one of the most important players for the team. While Adam Najem possesses superior technical ability, Muckette is involved with absolutely everything Memphis do going forward. He’s either there to bring down a long ball to open up space, or presenting himself for a pass when 901 FC is attempting to break through up by the opponent’s box. * Elliot Collier’s dribbling skills are going to be invaluable to Memphis’ attacking play. Against North Carolina, he always looked to take players on, consistently beating his man to get into the box and create chances for himself. He was unlucky not to score today, but should get off the mark again soon. *I’d like to see Memphis come out of the blocks quicker. It’s understandable that the team should heed caution on the road, but 901 FC barely had a kick of the ball in the opening 10 minutes. Against top quality opposition, you can pay the price for ceding too much ground, and an early concession changes the game entirely. *Memphis now has five points, good for 10th place in the Eastern Conference. Up next tomorrow is Atlanta United 2, currently residing at 12th in the standings. You can count on the Bluff City Mafia giving the lads a warm reception when they return to AutoZone Park.